Few months back there was a huge cry about the multiplexes and malls in Mumbai charging much more than the listed MRP ( maximum Retail Price ) for products. It was brought out by a few concerned citizens, picked up by the media taken to consumer courts and the writing was clear on the wall. 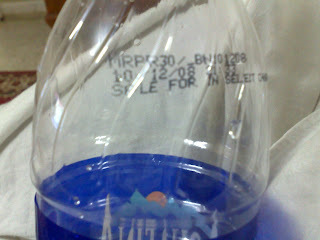 No one can charge more than the MRP printed on the product. The writing was clear on the wall, Selling a product over and above the MRP amounts to deficiency in service and exploitation of the consumer. There was the Weights and Measures department, the Packaged Commodities Act, 1977 (PCA) and the consumer courts to support the matter. I thought that was the end of the matter and was feeling good about something being corrected in the country, till today that is. Today I realized how the Great Indian Corporate political bureaucrat Mafia "killed"the issue. I had gone to the airport and since the person I had gone to pick up was late, i asked the vendor near the Departure terminal at 1B for a bottle of water. The man gave me the bottle and asked for Rs 30/-. Now, a bottle of mineral water across companies here in India costs between Rs 10/- to Rs 15/-. I straightaway told him that I am going to complain and that he better sell it at the right price. The man looked at me mockingly and told me to check the MRP. I did and found that it indeed was written there, Rs 30/-. Same bottle, same company same water costs Rs 15 all across Mumbai and here I was looking incredulously at the printed MRP of Rs 30/-. It also said, 'sale for in select CHA', Poor english too. Have a look at the photograph. The vendor was not done rubbing it in. He picked up a PET 500 ml bottle of Maaza and said pointedly, "this costs only Rs 20/- elsewhere but here it sells for Rs 50/- and yes, the Rs 50/- is the printed MRP.” Now unless the vendor is having fake stuff, which is a possibility, someone, the general public, has been had. What a complete solution? Ultimately the manufacturing company retains the right to decide the pricing? Since people and the activists and the courts were harping over not selling items above the MRP, they coolly changed the MRP itself. Now no one can complain. Slick! Only if these smart asses used their minds to improve something in this country.